Rabat- Speaking in Moroccan Darija, Italian-born Hachim Mastour said in an interview with the FRMF's media service that he chose Morocco instead of star-studded Italy because it's his country and that his parents were delighted by his decision. Rabat- Speaking in Moroccan Darija, Italian-born Hachim Mastour said in an interview with the FRMF’s media service that he chose Morocco instead of star-studded Italy because it’s his country and that his parents were delighted by his decision. “I chose Morocco (…) I found myself in the squad and I am happy to be here to play for the Moroccan national team,” said the 16-year-old Milanista. Dubbed the Moroccan Messi, Mastour said that he knows football teams competing in the Moroccan top flight including Wydad Casablanca, Raja Casablanca, Kawkab Marrakech, Moghreb Tétouan and Difaâ Hassani d’El Jadida. 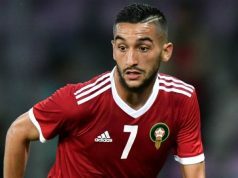 “I will give my all for the Moroccan team because it’s my country,” he added. Mastour is expected to be part of the Moroccan national team lineup for the 2017 Africa Cup of Nations qualifying fixture against Libya on June 12th in Agadir.